Overhead Wires Coming to H Street? Over the weekend, Greater Greater Washington had the news that Councilman Tommy Wells is introducing council legislation to provide for overhead wiring to the H Street/Benning Road Streetcar line in order to power the unit. The move would modify the existing 19th century legislation that overhead wires were prohibited in the L’Enfant portion of the city. This would be one step further to getting the streetcars flowing along the H Street corridor, as power has long been an issue in that fight. We’ll be watching this one closely. Judging by our tweets last week, streetcars are a project that has a serious following here, and obstacles to its successful launch will be met with…determination. Bloggers of the DC area, unite! Get this damn thing passed. It will be sad day if they allow overhead wires in DC. We have come a long way of not having to see these visual appalling hanging wires. I too want these streetcars, but this extremely poor planning. No finished design and they already purchased streetcars? This is a safety concern and over-budget disaster. We do not want another Metro-like transportation system. Before you ram this project through, lets make sure we are doing this right. Honestly, Schwetts, it’s hard to say they’re ugly if you haven’t seen the plans. Portland has overhead wires that are very low profile. While the ideal is to have an at-grade or underground power system, overhead wires would still be worth it. After the response the aborted attempt to kill streetcar funding got last week, I’m sure this will be a smoother ride. Right? 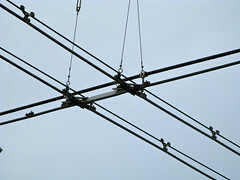 There are already overhead wires for telecommunications the trolley cables will be different how? These cables will not be going in the national Mall, or anywhere near any monuments. They will be going down H street, and eventually Georgia Ave, K street and other streets that are far from natural or pristine. These trolleys aren’t going through parks. These cables will be thinner than those pictured above. Furthermore This project is not being “rammed through.” This project is being driven by a deep and passionate desire by the people who live in the area. See the roar that went up last week when Vince Gray tried to kill the project. It is being “done right” There has been plenty of planning going back nearly a decade. Safety concerns? What safety concerns? There has been a trolley in Portland for the last 2 decades, and many European cities have had theirs for decades longer than that. Safety and planning are red herring arguements. The residents in the area want this, the Wardman wants this, the mayor wants this. What is the problem? I’m not sure where you are seeing telecommunication lines, I have not seen those in the city and they are considered overhead wiring. Remember they are planning 37-miles of track which includes K-Street, Georgetown and passing through the mall (check DDOT website). Are we going to have overhead wiring in these areas or different streetcars? For over a hundred years we have avoided overhead wires, and in our technology day and age, we reverse this law because of poor planning. We are not Seattle, Portland or San Fransisco, why should we follow them. hold DC government accountable and not give them a pass on this. The designer of this overlooked a big mistake and it makes you think what else they are looking over, and that is my safety concern. Again, I would like to see these streetcars, but we are going the wrong way about implementing them. This bill only exempts H Street and requires a feasibility study for wireless operation before 2014. So we will have to get different streetcars? The H-street line is suppose to extend to K-street, so I suppose they will allow overhead wires in this area too. Why don’t we redesign this now instead of wasting all this money on these streetcars.